This may be of interest to anyone who enjoys lending a hand towards a good cause. 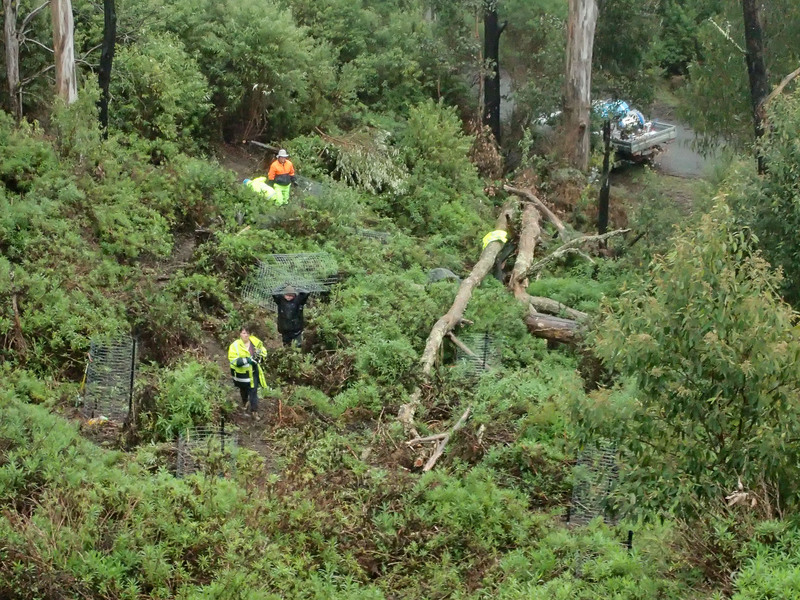 We are holding a small working bee next Wednesday (September 16th) to hopefully finish off the work on our Grand Ridge Rd planting project for this year, start time will be 9.30 am. Any helpers would be greatly appreciated, phone: 0488 035 314 or email friendsoftarrabulga@gmail.com for further details. 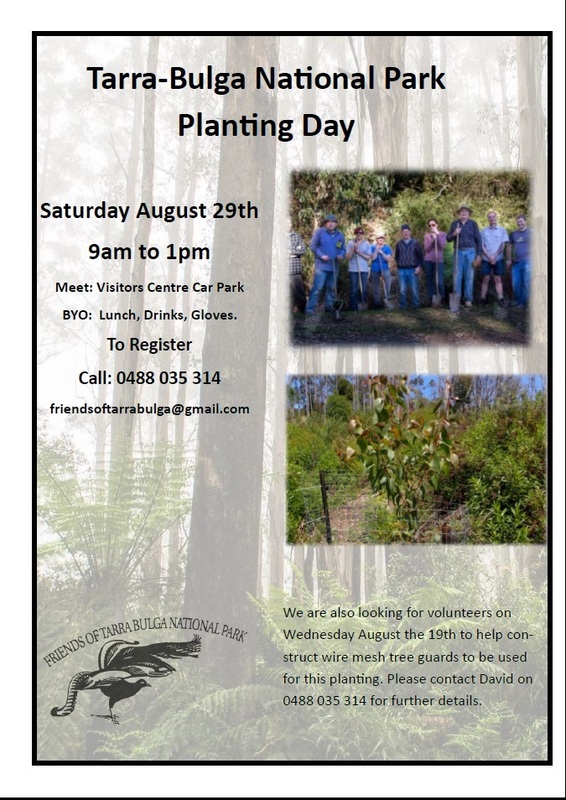 Friends of Tarra-Bulga are looking for volunteers to assist with a planting day on Saturday August the 29th. The planting site is on a north facing slope along the Grand Ridge Rd, it had been originally successfully planted with Mountain Ash in the early 1990’s. Unfortunately the fires in 2009 killed them all and there was no natural regeneration of new overstorey because they had not yet started to flower and produce seed. This is the second year we have done planting at this site and with the aid of strong wire-mesh wallaby guards progress towards restoring the site is going fantastically well. If you can’t make it along for the Saturday we do need volunteers to help make up tree guards before the event and may need to do some more planting later on if we don’t finish the job on the 29th, so let us know if you are available. The meeting point on Saturday the 29th will be at the park visitors centre at 9.00am. 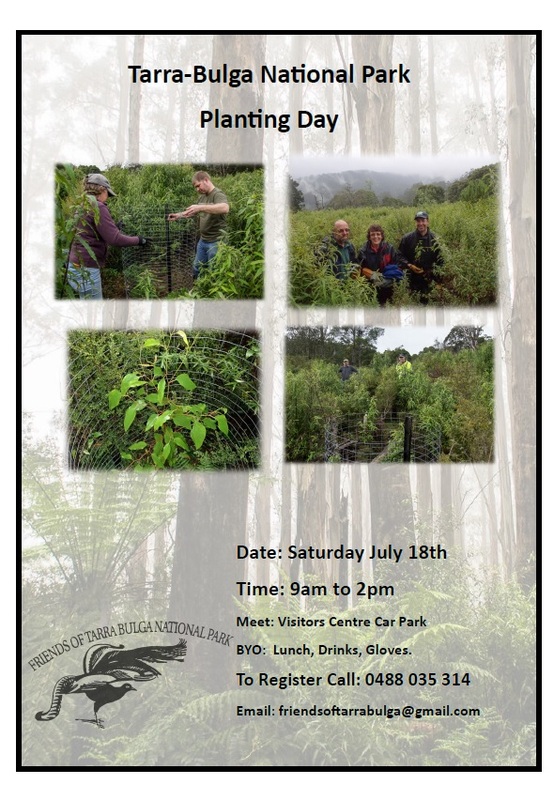 Friends of Tarra-Bulga are looking for volunteers to assist with a planting day on Saturday July the 18th. This will be the third planting we have undertaken at this site along Diaper Track and we are really starting to see some fantastic results. It would be a great opportunity for past volunteers to come along and view the progress being made, but anyone interested in helping restore a towering Mt Ash forest is encouraged to come along. The meeting point will be at the park visitors centre at 9.00am. To register phone David on 0488 035 314. Working Bee (Tutsan and Sycamore Maple) – Saturday March 21st. Our first group activity for the year will be held at a site in the park along Tarra Valley Rd that we have been working on for nearly a decade now. Initially we started tackling a serious infestation of Sycamore Maple, which is a tree that can be very invasive, it has light papery seeds that disperse in the wind, it can grow in shade and then potentially become a large tree. Over the years we have pulled out hundreds of new seedlings that have spread into the park and cut out and killed many larger saplings. Tutsan with some fruit ready to spread more seed into the park. We have now been successful at getting the Maple fairly well controlled and we have now also started on another weed (Tutsan) that is established at the site. 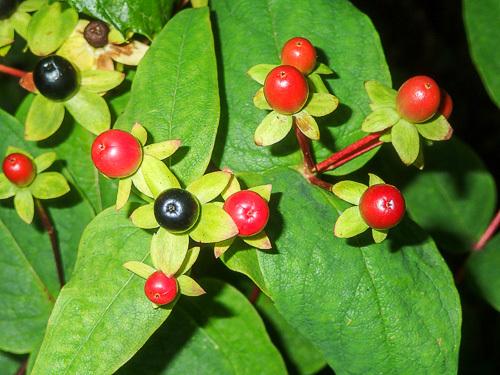 Tutsan (Hypericum androsaemum) is a perennial shrub that grows to about 1.5m tall, it is related to St John’s Wort and is noted as being a serious threat to damp and wet schlerophyll forests. We have received a Communities for Nature grant to assist our efforts that will be used to fund contractors to spray the larger infestations as well as to purchase some hand tools and chemical to support our efforts. We will be holding a working bee at the site on Saturday March the 21st. The meeting point will be at the Tarra Valley Car Park at 9.30am. Like many of our working bees’ the terrain will be steep and lots of scrambling through undergrowth will be required. Tools will be available but if you have your own favourite gloves or loppers please bring them along. Following the work we will have a free BBQ lunch provided down at the Fernholme Caravan Park (at around 1pm). If you are able to come along please call or email David Akers (0488 035 314) or friendsoftarrabulga@gmail.com preferably by March the 18th so we know how much food to buy. Hand Direct Seeding Trial to Combat Hungry Wallabies. Grazing Swamp Wallabies are a huge hurdle to successfully growing new trees in sections of Tarra-Bulga National Park. Hard lessons have been learnt, 1000’s of trees have been planted, but experience has shown that even if they are hidden or planted among unpalatable species the Wallabies will eventually find them and eat them. Regular tree-guards have proven to be of little use, they may protect the plant for a short while but Wallabies will chew any growth at the top of the guards that they can reach, the plant will remain stunted and eventually die. A commercially available Wallaby repellent mixture can be sprayed on new growth to protect it, but that is labor intensive and requires regular follow up to have any chance of success, not a viable task in our situation with limited time and rough terrain to encounter . The only strategy that does seem to work for us is to use large wire mesh tree-guards which are expensive and very labor intensive to install and eventually remove once the trees have grown big enough..
Why do we think direct seeding might be a solution? Nursery grown tube-stock are generally grown in ideal conditions, with fertiliser, controlled sunlight and regular watering, as a result the leaves are highly palatable. Plants that germinate from seed on sites should be tougher, slower growing and as a result have less tasty foliage. Mountain Ash along with other species of Eucalyptus seeds are very small, one gram of Mountain Ash seed contains nearly 200 viable seeds. For our trial we have 390 grams of Mt Ash seed, if all of them germinate we would have almost 80,000 seedlings scattered over the site. That is clearly an optimistic outcome but hopefully we can get a good germination strike rate and some of those tiny little seedlings can overcome the Wallabies and other forces of nature to successfully grow into mature trees. We will keep you posted. Mountain Hickory Wattle, seed should still be good even though it is 8 years old. Mountain Ash (Eucalyptus regnans seed) potentially 78,000 trees in this bag. With a willing crew of volunteers all set to go at 9am we loaded up the trailer, towed by the Rangers quad bike, with our diggers and sledgehammers and we were off. Car pooled down to the start of Diaper Tk and then enjoyed the downhill walk to our planting site. Target for the day was to plant and guard 70 future forest giants. Doesn’t sound too difficult some might think for a crew of 7 volunteers (that’s just 10 plants each). Indeed actually planting the trees was not hard at all, getting the large wire mesh tree-guards into place and installed was a lot more challenging. By lunch time we figured we were more than halfway there, and with the help of Craig using his chainsaw to improve access to some sections of the site, we were able to get all the trees in the ground, well spaced and guarded by about 3pm. Note that we will need to do some improved path clearing if we go ahead as planned to put more trees into this site next year. With tired bodies, the uphill walk out seemed a lot longer than the walk in, it was highlighted however by the disturbance of a nesting Lyrebird who had chosen quite a vulnerable site to raise her egg, not far off the ground at the edge of the track. For, those that couldn’t make it and anyone keen to go again, we are having another planting at a different site on September the 6th.